HOUSTON, TX- October 11, 2010- George Clinton is generously donating $10,000 and 25% of the Funkadelic Music Catalog to the Barack Obama Green Charter High School through his foundation, Mother’s Hip Connection Education Foundation. These funds will help to educate the students on artists’ rights in his hometown of Plainfield, New Jersey. He will also be awarding an additional 10% of the Funkadelic Music Catalog to two local churches and a local temple. “Giving on behalf of the different members that have outstanding amounts of money [owed to them] that came from New Jersey is important because every member has unpaid royalties from writing, production, and publishing,” says Clinton. George Clinton is generously donating $10,000 and 25% of the Funkadelic Music Catalog to the Barack Obama Green Charter High School through his foundation, Mother’s Hip Connection Education Foundation. These funds will help to educate the students on artists’ rights in his hometown of Plainfield, New Jersey. 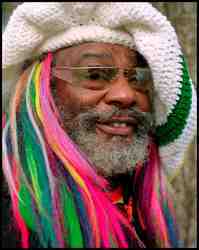 He will also be awarding an additional 10% of the Funkadelic Music Catalog to two local churches and a local temple. “His willingness and desire to share his experiences and knowledge of the business of music creates an environment that deepens our students understanding” says, King. Because this is such an epidemic in the music industry, Clinton is starting a legal defense fund for musicians. Clinton continues to fight his defendants vigorously for the uncollected royalties owed his band mates’ families. The Barack Obama Green Charter High School’s mission is to educate students to become informed, knowledgeable and engaged independent critical thinkers. The school, its staff and community partners will create a learning community that provides students a rigorous academic environment designed to engage students and creatively apply their knowledge to problem solving activities. Using local, national and international sustainable development issues related to the challenges of climate change, clean energy (solar wind, bio-diesel fuel) and a “low carbon green economy” - children will learn to see the connections between themselves, school, their community and the world. We will examine these issues as a means for students to be developed, supported and inspired to view challenges as their opportunities to apply creative solutions. At The Barack Obama Green Charter High School, we work to enable all students to be lifelong learners, exemplary, responsible citizens, caretakers of the environment, and leaders in the global community.